Calling local artists! Durham Food Hall opens in Liberty Warehouse March 2019 – help us bring the Hall to life by submitting a proposal for 1 or more of our 5 opportunities for murals. Durham Food Hall is in the historic Liberty Warehouse, occupying a 15,000 square foot space with 10 mini eateries by top-tier Triangle chefs, two bars, multiple event spaces, and lots of seating for dining, gathering, coworking, live music, events, and more. There are six areas of varying size throughout the hall where we would like to have local artists create murals. More info on the specific placements below. The entire Hall will maintain sustainable values throughout, with regular practices like composting and re-using materials at every chance. Submit your artist sketch, resume, and references to paint a mural by 6 p.m. on January 11, 2019. Artists will be selected based on submitted sketch and each given a stipend for your time and to buy supplies to paint one of the spaces outlined below. Walking Ramp Space – Click to view larger. 16′ x 10′-6″ wall at the back of a walking ramp from the lower level to the higher level of the main floor. The space is floor to ceiling, and is visible across the hall above 42”. The ramp will be a high traffic area as it is one of two routes to the restrooms, built as the ADA accessible path. There will also be 2 sconces on the wall, which will illuminate the mural and should be taken into consideration for the overall design. The sconces will be thin black, and pipe like in shape with bulbs on each end. They are 12” long and will be positioned 10 ft apart. 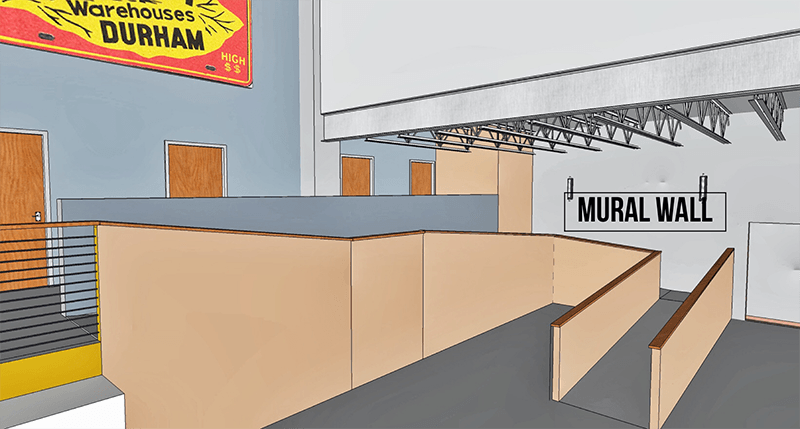 We would like to see an abstract design in this space, but are open to subtle references to Durham (no Bulls, please) and the overall design of the hall is mid-century modern with some industrial touches. 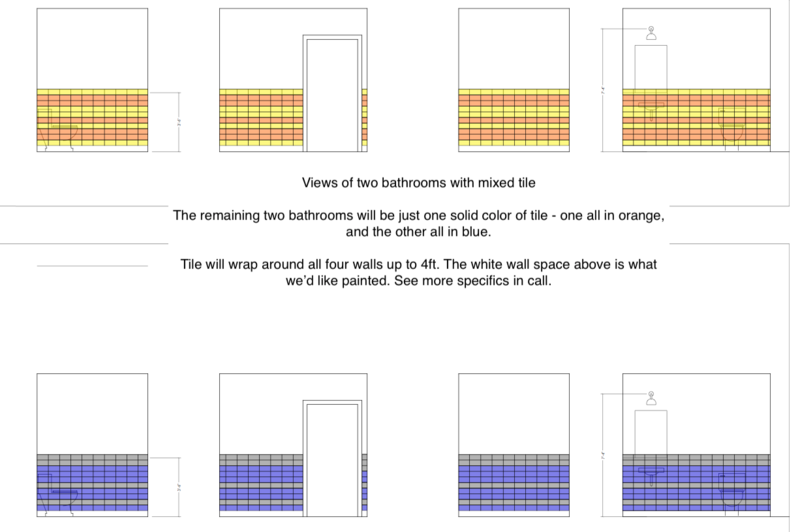 The stipend for this wall is $600-$1200, depending on the final square footage chosen by artist to cover. 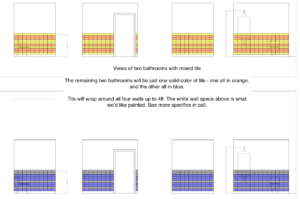 Bathroom Spaces – Click to view larger. Stipend for each bathroom is $200. Artists will be able to access the space for painting in early-mid February. Work will be featured in soft-opening events and Grand Opening, and artist names will be included in press mentions and tagged on social media. We’re happy for artists to also tastefully sign their names by their murals. Artists may work in teams. To submit, please include the space you’re interested in, a simple sketch of your proposed design, your resume, and two references to info@durhamfoodhall.com. Location: Durham Food Hall, 530 Foster St., Suite 1, in downtown Durham. ground floor of Liberty Warehouse, in the Central Park Neighborhood across from the Durham Farmer’s Market. After its heyday as one of the longest running and most successful tobacco auction houses in the South, Liberty became an artist haven, home to Liberty Arts Studio and Foundry (where Major The Bull was poured!) and The Scrap Exchange. It has since been re-developed into an apartment building with ground floor retail, where Durham Food Hall has found its home.